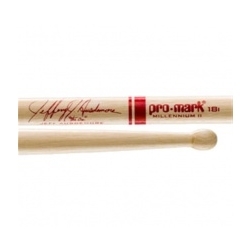 The Jeff Ausdemore autograph snare sticks have a fast feel, due to the thin neck which bodes well for quick response in either single stokes or multiple bounce rudiments. The DC8's shoulder also flares out quickly to handle rim shots, and the shaft provides a full feeling in the player's hand. The small bead provides a very clear articulation and a focused attack at all volumes.